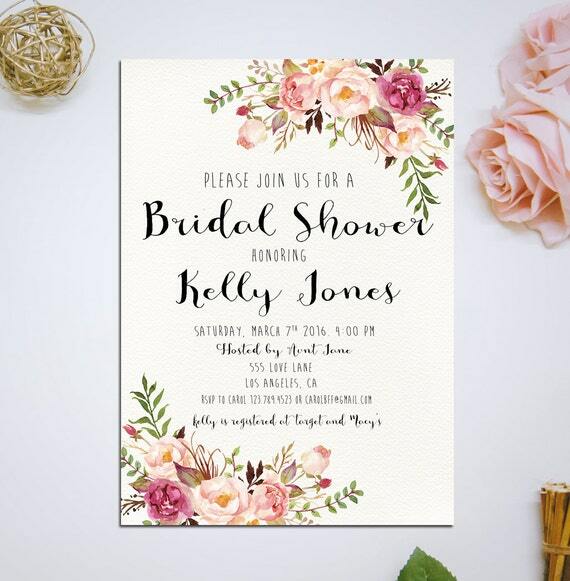 Getting ready for a bridal shower can be fraught with nerve-wracking moments, and choosing and sending out invitations can be one of them. Buying expensive custom-made invitations can skew your budget and take away from specialty foods you want to offer guests. 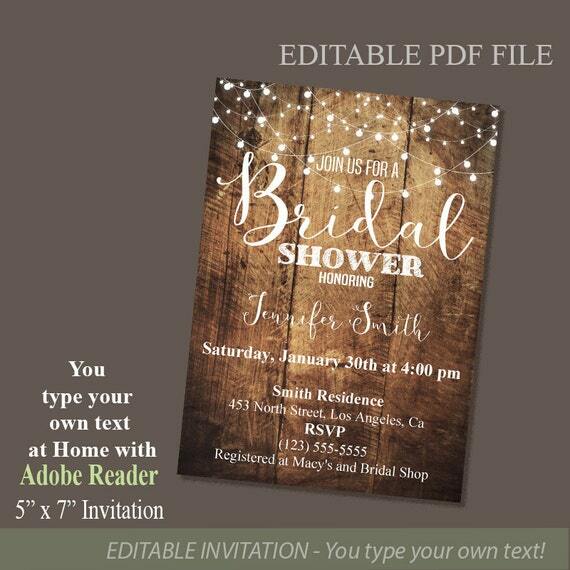 One helpful way to alleviate the nerves and the extra expenditure is to use printable bridal shower invitations. With home printers advancing in technology, you can spend a small amount of money and get personalized shower invites for your party. 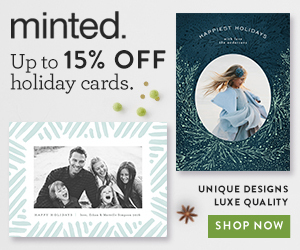 Ordering printables is quite easy. Select the style you like the best. 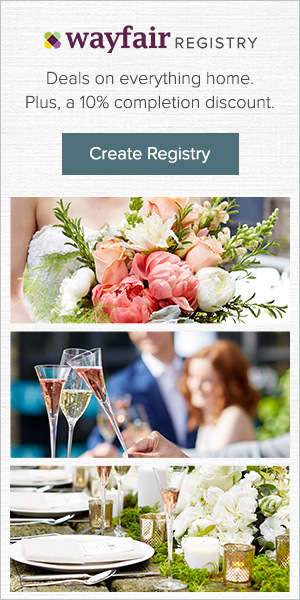 Then decide on how you want them to be personalized for your event. Then place the order and within 24 to 48 hours, the designer will create a customized version just for you. You download the digital file, and then print out as many as you need. Since it is a digital file, you can also just send the invitation out in an email. 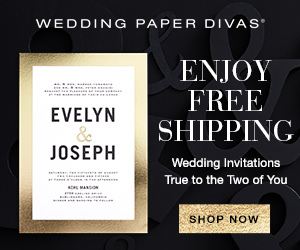 Whichever way works best for you, it is still cheaper and much easier than ordering print invitations. 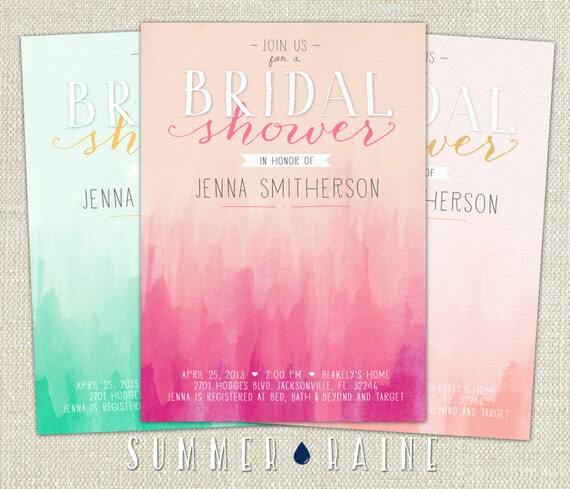 Here is a selection of lovely printable bridal shower invites that you can order for your party. 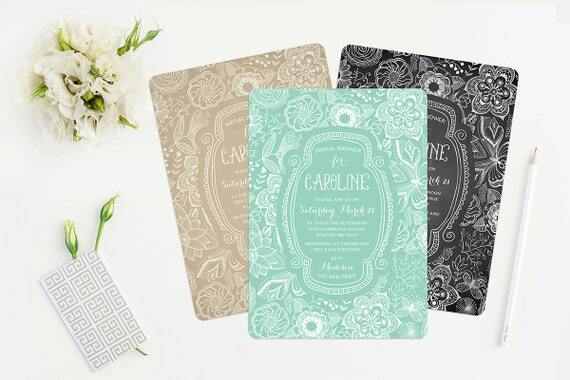 Each of these invitations is created by an independent designer who sells them on Etsy. 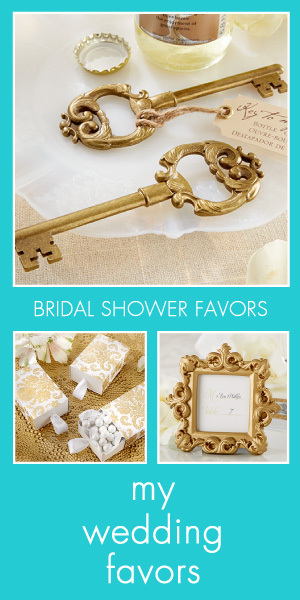 Many of them have matching wedding invitations, envelopes or other printables that you can order to match the shower invitations. Of course, each artist does not only make one design. If you like the artist's work, but not that specific invitation, just click the image or button and you will land in their store to browse further. Designers love to help out their customers, so feel free to click through and ask them any questions you have. Pricing and size is available on the product page after you click. This is a lovely invitation which is simple in design. All of your focus is on the painted flowers in the upper right corner, especially the rose. As you can see in the image, this invite is part of a larger collection. 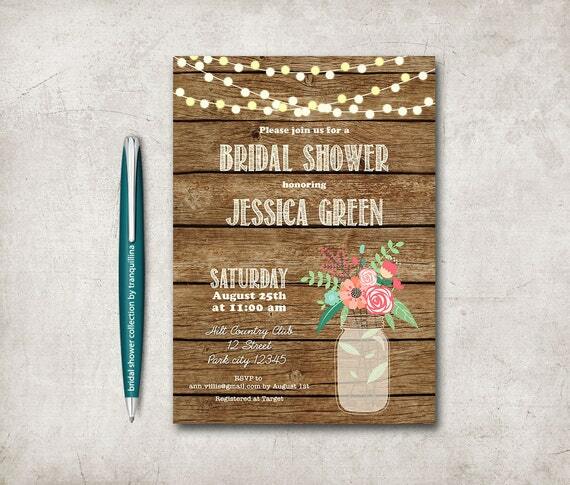 Rustic themes are very in style right now, and if you like that type of look, this invitation is a good example. The wood background looks real with the adorable strung lights and Mason jar bouquet in the corner. Click to the product page for personalization and size. Simple and sophisticated, this invitation is bold in a subtle way with a large hand-lettered image in gold to catch the eye. This invitation can be used year round and would match any theme with simplicity or sophistication. 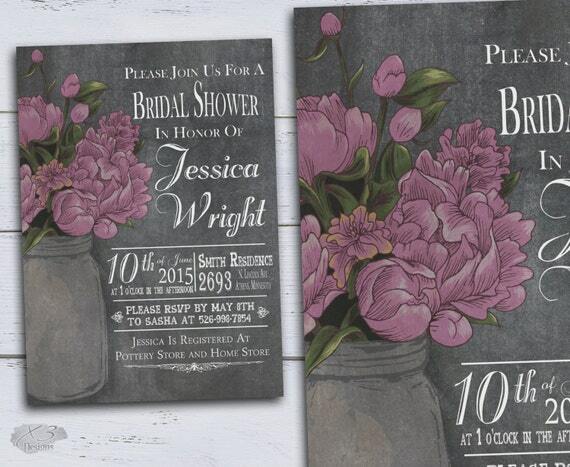 More of a country style, this is a very welcoming invitation with sprays of flowers in upper and lower corners. It has an off-center feel which gives it a casual air. Click for size and price. A more contemporary look, this simple black and white invitation comes with a printable envelope insert that you can see in the image. For more details, click the image. 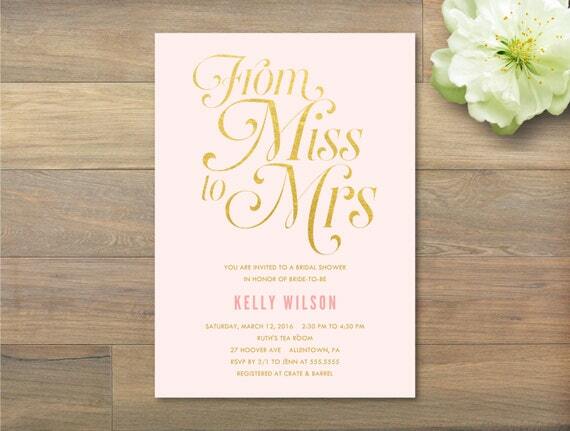 Lovely and subtle, this feminine invitation is perfect for a classic bridal shower, and would also be lovely for a spring or summer event. 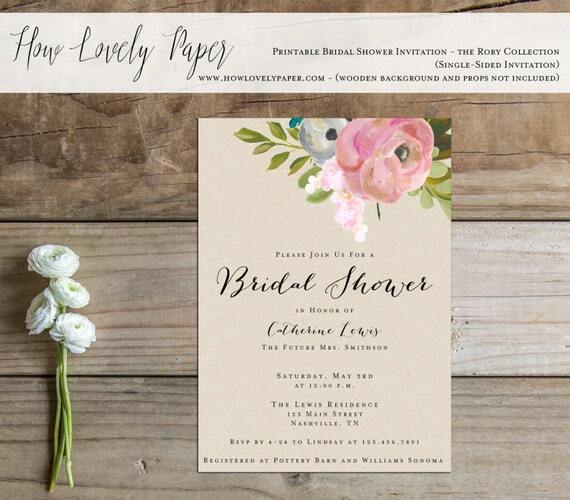 The watercolor flowers give the invite an artsy appeal. 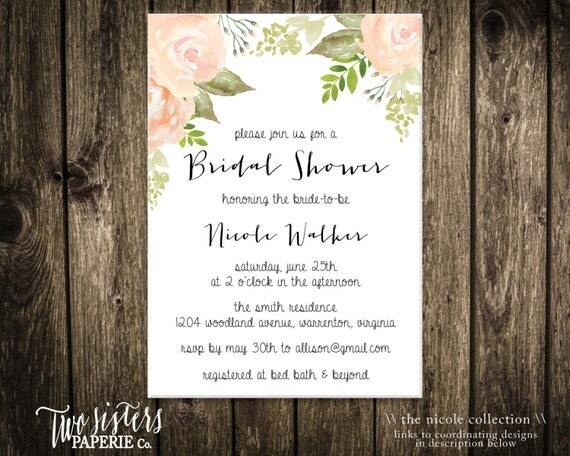 Vintage themes are popular for weddings, and this invitation carries the theme to the bridal shower. The fonts and hand-lettering in the image on top are very creative and eye-catching. Click the image for more information on this invitation. 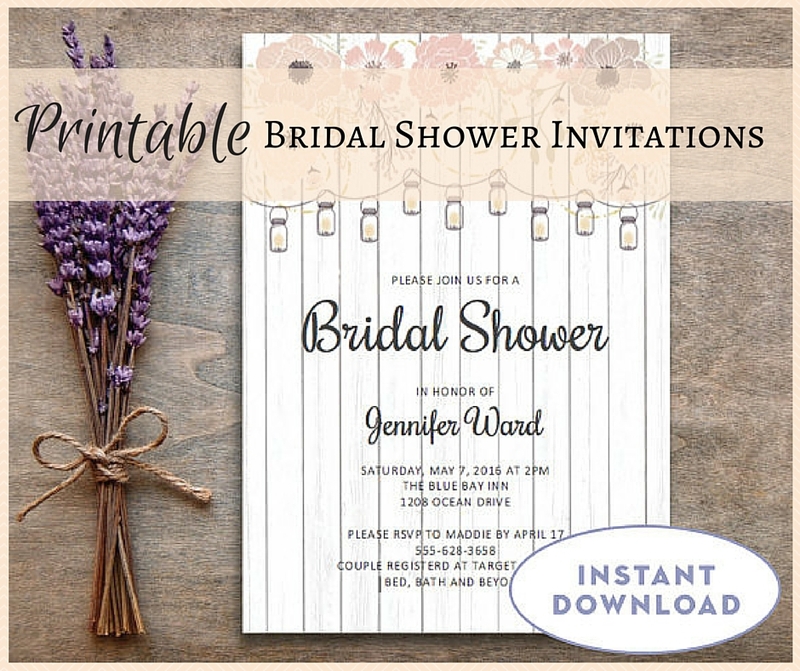 You can choose your color background for this intriguing invite, and the print is in white. 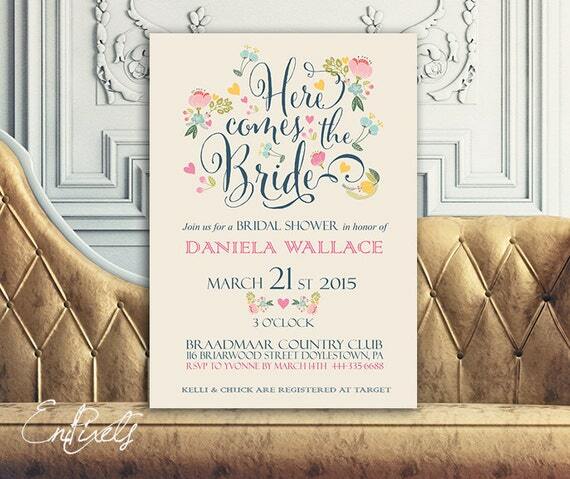 Very artistic, this bridal shower invitation reminds me of a coloring book or shabby chic design. 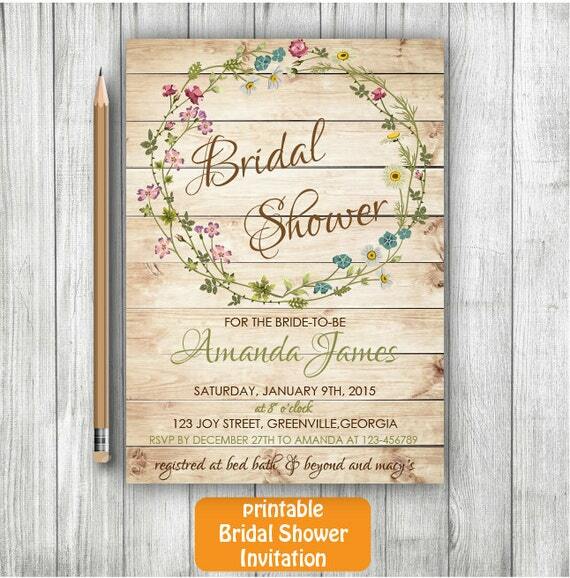 Another cool rustic design, this shower invitation has a three-dimensional effect. The lights brighten up the dark wood background, and the white font shows up very well. 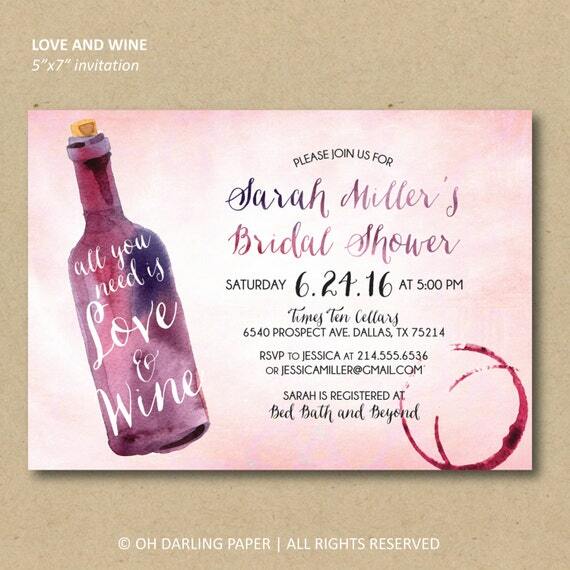 Who could resist an invitation to a wine-themed bridal shower? 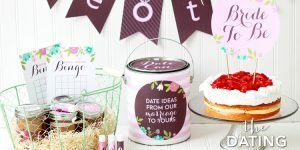 Great for an evening or afternoon shower or even a bachelorette party, this invitation is adorable. Click for more details on how you can personalize the invitation. If you want an invitation that is not in pink, here is a great one. 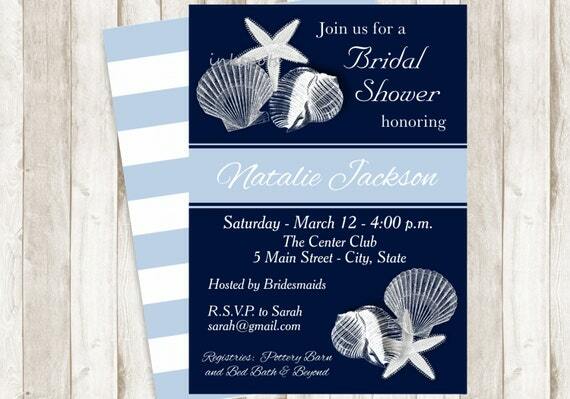 With a beach or nautical theme, this bridal shower invitation features sea shells on a navy blue background. Great for a beach-themed wedding. 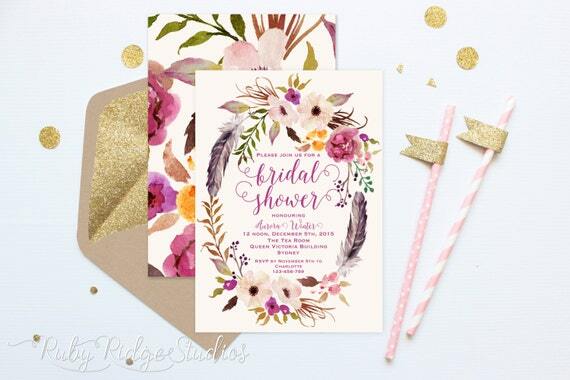 Bright and colorful, this romantic watercolor design will definitely wake up your guests when they receive it. A gorgeous watercolor wreath frames the text for a splashy presentation. Click the image to find out more about pricing and sizes. This rustic design is unusual in that the wood is a lighter color and it combines a delicate wreath on the top. It is a mix of rustic and country, very nice for a spring outdoor bridal shower. The ombre look is very cool and reminiscent of tie-dye and the 60s. 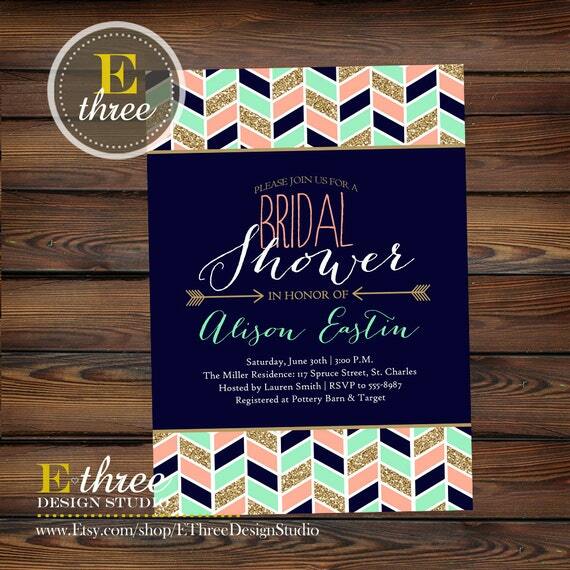 It is an unusual background for a bridal shower invite and you have your choice of colors. I had to include a chalkboard invitation since people are loving the chalkboard style right now. This one adds to the concept with a bouquet to add color to the gray and white design. Click the image for pricing and information. 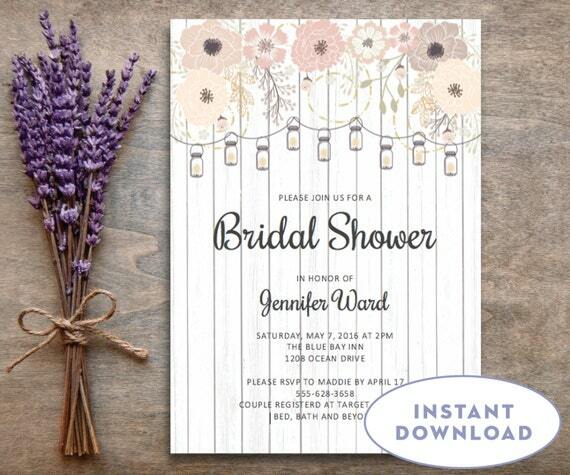 This lovely invitation is rustic in style, but classic in colors. It is ideal for an outdoor summer bridal shower with the string of Mason jar lights and flowers as a backdrop. 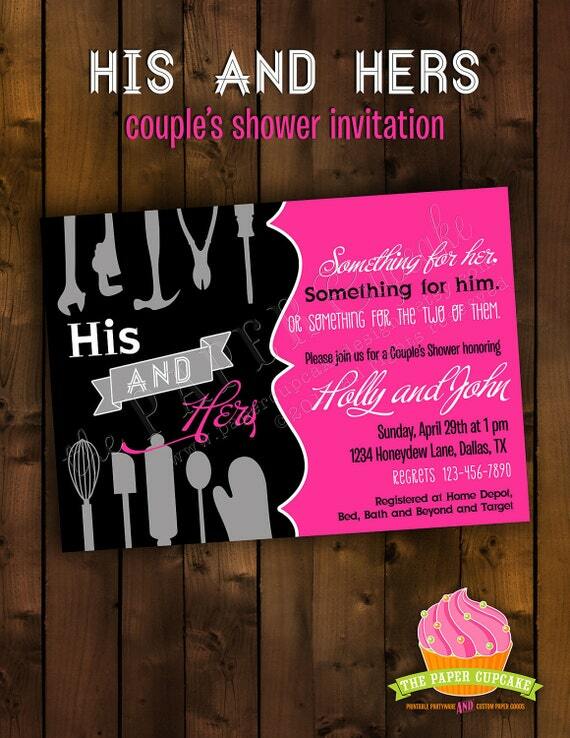 This bold invitation is great for a couple's shower. It is bold enough not to scare of the men and and features tools and kitchenware to represent both genders. Click the image to see how you can customize this invitation. 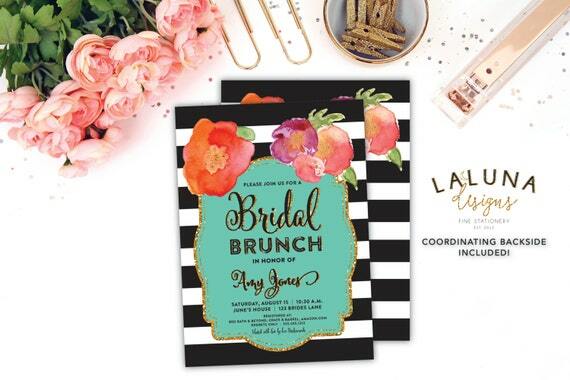 Bold and beautiful, this invitation is for a bridal shower brunch which is a popular way to celebrate the bride. 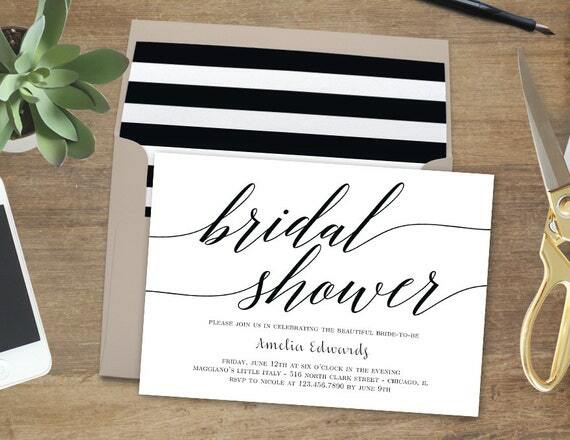 This invitation has everything, bright colors and black and white, so no one will miss it when you hand them out. A more modern design with the popular chevron pattern as decoration, this has pink but only as an accent (more like a salmon pink). The gold adds pizzazz and the navy stabilizes the design to focus the eye in the center. Very nicely done. Click through to get information on this invitation.